If you have space in your garden, plus the desire to build and maintain a garden pond, definitely consider taking the task on. 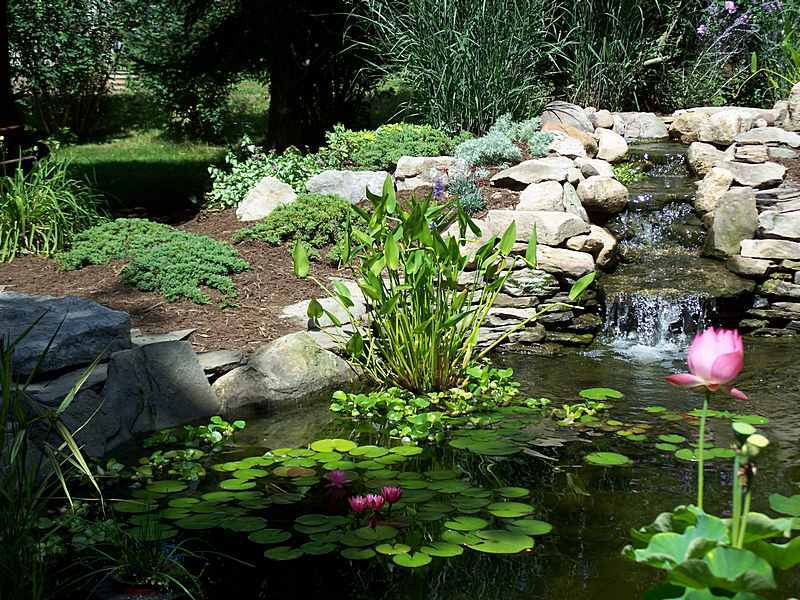 Inground water pond is an entire ecosystem of its own and water feature transforms any garden into a serene retreat. Most garden centres and large stores offer beautiful, relatively inexpensive and innovative products that will make building your pond easy. 1. Location: Select your location based on how you plan to use your pond – whether you want to be able to see it form your kitchen window or create a setting for outdoor entertaining, etc. Avoid placing your pond under or close to trees that will drop leaves or needles – that would add additional maintenance to your pond. Consider slope, soil,sun, shade, wind and utility lines when planning the location. 2. Slope: Place the pond on a flat area above the lowest spot on the site to avoid overflow by rainwater, causing muddy waters and possibly washing away plants and fish. 3. Soil: Clay soil, although difficult to excavate, hold its shape and flexible liners will conform to whatever configuration you dig out. Create a series of internal ledges that will provide bases for large boulders to gradually incline upward to the pond margins and for marginal plants to be placed in pots and in the pond. 4. Sun,Shade and Wind: Position your pond where your plants will get at least 6 hours of direct sunlight each day. Wind can speed up evaporation and damage plants and shrubs. You can consider windscreens in windy spots. 5. Utilities: Call before you dig to avoid installing over gas, electrical or sewer lines. The closer the pond is to electrical outlets for fountains, lights and a pump, the less expensive it will be to run lines to it. Running a water line is only necessary if you can’t reach the pond with a garden hose to top up the water levels. Plants can make or break the function of an ecosystem. They will provide valuable biological filtration by removing nitrogen, ammonia, nitrates and other nutrients from the water that algae would otherwise feed on. Submerged and marginal plants provide food, shade and protection for fish and other wildlife that live in and around your pond. Some blooming plants will attract beneficial birds, insects,butterflies,frogs and others to your watery paradise. Floating level plants, such as water lilies will shade water surface and absorb dissolved nutrients that contribute to algae proliferation. 1. Submerged Plants: Sometimes referred to as oxygenators, these aquatic plants grow totally submerged underwater. they liberate oxygen that clears water, prevents growth of algae and allows fish to breathe. Good ones are: parrot feather, foxtail and water violet. 2. Floating – Leaved Plants: Floaters drift on the water surface, providing shade to lower water temperatures and protection for fish. The absorb dissolved nutrients that encourage growth of algae and their roots receive and protect fish eggs. The include: water lily, free-floating fairy moss and water hyacinth. 3. Marginal Plants: Marginals are shallow water or bog plants that sit on ledges built along the edge of the pond. Their main function is decorative, but they also provide necessary shade. They include winter hardy arrowhead, yellow water iris and cattail as well as tropical, nonhardy taro, canna and papyrus. 1. Pumps and Filters: A pond filter/pump system is the single most important element of any pond. Not only does it function as a water clarifier, but it is also the heart of the fish’s health. Always install a system slightly larger than needed to allow for fish growth. Length of the liner = length of the pond, plus 2 x depth plus 2 feet. Width of the liner = width of the pond plus 2 x depth plus 2 feet. 3. Deterring Pond Predators: Edge your pond with rocks or flagstones, arranging them to hang out over the water 6 – 8 inches. Place rocks high enough from the water surface so that predators can’t scoop out fish. Another solution is to place predator netting over the pond, or motion=senser sprinklers to spray the predator when it approaches. Hope this will be helpful to you and please send in your comments, suggestions and experiences. Your input is always very welcomed and much appreciated. Hallo, Mama nice post, nice blog i like this.. Thanks so much for your comment – I love hearing from people who enjoy my website!